Every Wednesday evening in September, I went to a class on Illustrating Children’s Picture Books at the WEA. This is the fifth WEA course I’ve completed, the others so far being Wonders of Ancient Egypt, Magic For Beginners, Singing For Beginners, and Great World Thinkers and their Great Ideas. I won’t be doing any more in the foreseeable future. There are all sorts of reasons for choosing a particular WEA course. Sometimes it’s to build upon a skill or interest that you already have, but in this case I wanted to try something new. I really enjoyed it. For one thing, it had a much more social atmosphere than the other courses I’ve done — there was plenty of opportunity to informally and spontaneously share our thoughts and ideas. I was the only male in the room, which suits me just fine, but I wouldn’t have predicted that. Classes often started with spontaneous drawing exercises, such as drawing squiggles (in the technical sense popularised by Mr Squiggle), line drawings and five-minute sketches of named objects. I won’t share mine; they are not very impressive. Another interesting exercise from the first class was to draw an illustration of the theme “Afternoon tea with Auntie“, but with the requirement to add some sort of twist. This exercise came just after a discussion of how illustrations can add to a story rather than simply repeat it (one example given was the book Just Another Ordinary Day by Rod Clement). My solution was to try to draw the scene from outside a window, looking in: a person inside the room would see a perfectly ordinary scene of a woman and a boy eating afternoon tea together, but leaning against the wall outside, I drew a broomstick and a book entitled “How to Cook Food that turns Children into Frogs“. Again, I won’t actually show you my picture. Trust me, you’re not missing much. Our homework from the first class was to look at as many picture books as we could in search of styles that we might emulate, and to choose one or two to bring to the next class. I arranged to visit my parents that weekend, as they still have a whole stash of books that once belonged to my sister and me. While I was there I also printed pictures from the Internet that would be useful when it came to illustrating my story (at home I don’t have a colour printer). We spent much of the second class sharing the picture books we’d decided to bring along, and explaining how they inspired us. 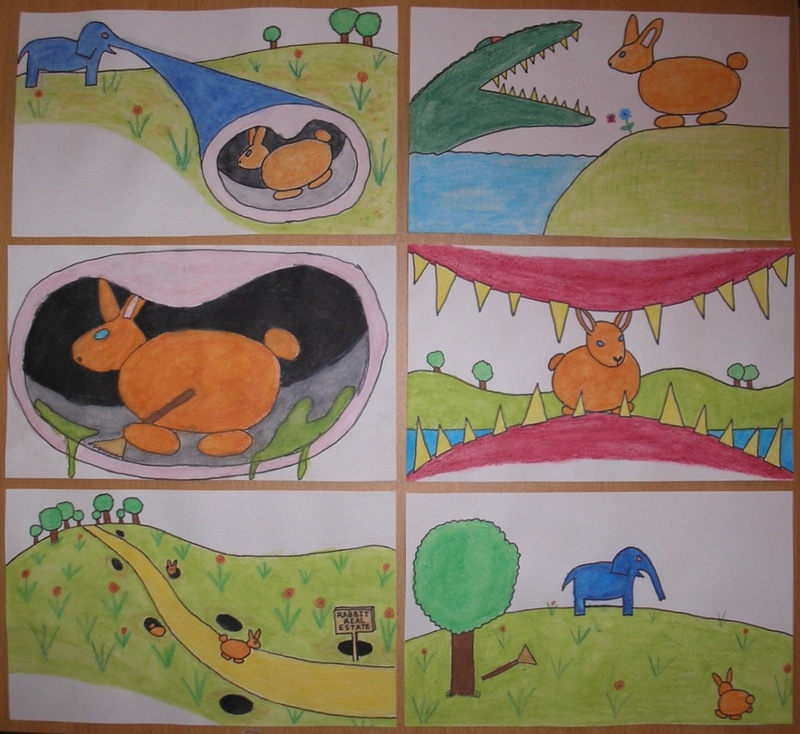 Our homework from the second class was to buy the requisite materials to illustrate in the style we had chosen. 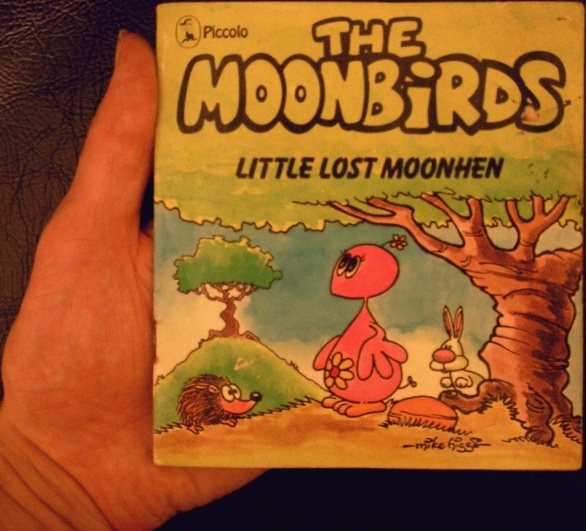 Having taken some of my inspiration from the Moonbirds books, and some from images I found on the Internet such as this and this, my choice of equipment included watercolour pencils, a felt-tip pen, and two different sizes of paintbrush. The story I’d chosen to illustrate was a poem that I wrote several years ago when my cousin’s daughter was learning to read. I formed most of my ideas about how the book would look during that weekend at my parents’ place: the size of each page would be A6 landscape (the size you get if you fold an A4 sheet into quarters) and the layout would be as shown in the illustrations below. I deliberately arranged it so that no verse of the poem is ever wholly visible at the same time, because that way you always have to turn a page to read the end of a verse, which I think adds suspense. I only had time to do the illustrations for six pages, but you can see those in the image below (pages 1, 2 and 3 in the first column; pages 4, 5 and 6 in the second column). 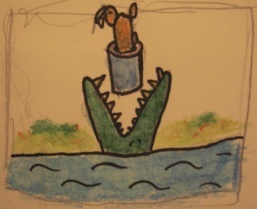 As for the remaining pages, page seven will show the crocodile biting off the elephant’s trunk with a castle in the background, and page eight will show the rabbit and the elephant’s trunk falling into the crocodile’s gaping mouth. To help you visualise the latter, here is the proof-of-concept thumbnail that I drew in the planning stages (I didn’t even try to get the white balance right in this photograph, as it’s only a rough sketch in any case). O brave new world, in which folding a standard-size piece of paper in half produces a piece of paper of another standard size! The answer in millimetres is given by this formula and comes to 24.511667808963589190336286050032.